CWDM mux/demux is a flexible solution that enables operators make full use of available fiber bandwidth in local loop and enterprise architectures. The wavelengths used with CWDM implementations are defined by the ITU-T G.694.2, listing 18 wavelengths from 1270nm to 1610nm with 20nm increased. CWDM solution takes the most important advantage of low price which is typically 1/3rd lower than the equivalent DWDM optics. FS.COM introduces its new generation of coarse wavelength-division multiplexing (CWDM) devices boasting increased functions and improved performance to extend the reach of CWDM metropolitan networks. The following text will introduce CWDM Mux/Demux, CWDM OADM, and optical port configuration used in CWDM network. The CWDM Mux/Demux in FS.COM is a universal device capable of combining up to 18 optical signals into a fiber pair or 9 optical signals into a single fiber. It is designed to support a broad range of architectures, ranging from scalable point-to-point links to two fiber-protected rings. Besides, FS.COM CWDM Mux/Demux is a passive device which allows for any protocol to be transported over the link, as long as it is at a specific wavelength (i.e. T1 over fiber at 1570nm transported alongside 10Gbps Ethernet at 1590nm). This allows for long-term future proofing of the networking infrastructure because the multiplexers simply refract light at any network speed, regardless of the protocol being deployed. 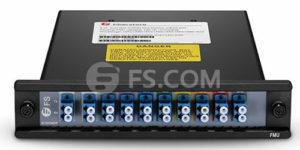 The following image shows FS.COM 8 Channels 1470-1610nm Dual Fiber CWDM Mux Demux. FS.COM also provides CWDM Mux/Demux with different optional port configurations such as, express port, monitor port, 1310nm pass band port and 1550nm port for these multiplexers according to customer choice. 1550 pass band port: The 1550 pass band port allows a legacy 1550nm signal to pass through the CWDM Mux/Demux module. The 1550nm port can also be used in this way as an optical supervisory channel (OSC) and its range is 1510nm-1590nm (1550nm±40nm). When you choose 1550nm pass band as an OSC, the available range of wavelength is 1270nm~1490nm on the CWDM MUX modules. Note: that standard (or native) 1310nm and 1550nm wavelengths are not the same as CWDM 1310nm and CWDM 1550nm wavelengths. The center wavelength tolerances for legacy 1310nm and 1550nm are much wider than the CWDM equivalents, and therefore not precise enough to run through CWDM filters. When implementing a CWDM network, a standard wavelength can be converted to CWDM wavelength, or a CWDM Mux with a pass band port can overlay the standard wavelength onto the CWDM common link. A pass band port is an additional channel port on a CWDM MUX that allows a legacy 1310nm or 1550nm signal to pass through the network within a reserved band. The legacy device is connected directly to the pass band port via fiber cabling. Standard wavelengths can be converted to CWDM wavelengths using CWDM Small Form Pluggable (SFP) transceivers, transponders, and media converters that support SFPs. Since adding new fiber optic cables for signal transmission of the devices would cost too much, IT managers would turn to use OADM in CWDM network, which can couple two or more wavelengths into a single fiber as well as the reverse process, saving a lot of money and installation time when they want to add or drop signal on a single fiber. FS.COM provides a wide selection of CWDM OADM which can add or drop fiber count of 1, 2 and 4. And these OADMs can be categorized into three type with different package form factors: plug-in module, pigtailed ABS box and rack mount chassis. The plug-in modules can be installed in empty rack enclosures. Three CWDM OADM types with different package form factors are shown below. CWDM is a popular technology which can provide cost-effective solutions for users to upgrade their network using the least fiber strands. FS.COM provides a series of devices used in CWDM network, like CWDM Mux/Demux with different optical port configurations, CWDM OADMs, CWDM transceiver modules, etc. For any requirement, please visit FS.COM.